Ben Cohen Hot 7 at Bude 1998, courtesy of Alex Revell. L-R: Nick Ward, Terry McGrath, Alex Revell, Mick Clift, Ben Cohen, Geoff Over, Jon Penn. I came very late to this particular party, but happily the party still rocks on in cyberspace. Let me explain. The searing yet also lyrical cornet player, singer, and bandleader Ben Cohen moved to another neighborhood in 2002, when he was 73. I didn’t take notice of his work until last year, when I heard him on a record featuring the late clarinetist Pierre Atlan, which also starred Humphrey Lyttelton — but one side of the disc was a 1987 session showcasing Ben, whose KNEE DROPS astonished me with its hot fluency and mastery. I regret that I can’t share this music, but the record is on eBay, like so much else (including two CDs featuring Ben, posthumously). I contented myself with playing the record many times, then browsing through my shelves, where I found him appearing with Jean Francois Bonnel and Wally Fawkes, among other luminaries. I looked in Tom Lord’s discography and found that Ben had recorded widely from 1950 to 2000, a very long time to be in one’s prime. And there the matter would have remained, were it not for the gracious fellow who calls himself JazzVideoMike on YouTube — the link will lead you to his channel, where you will find yourself enchanted. In real life, he answers to Mike Stevens. Ben Cohen played in Brian White’s Magna Jazz Band for many years right up to his passing. The Magna played weekly and from about 1990 I went weekly and got to know Ben. I started videoing jazz when I went to the French Quarter Festival in 1995 and bought my first camcorder on Canal Street. I then started going to the Bude and Keswick UK jazz festivals and making videos whenever possible, which I have continued right up to now. I met Ben at these festivals and found that his style of playing with his Hot 5 & 7 was much more to my taste than his style with the Magna band. His early Louis style playing caused quite a stir, and admiration from many musicians. After 2000 Ben suffered several strokes, but he refused to stop playing and it was a more serious stroke which eventually brought him down. Ben was a lovely man and greatly admired by many. [Sarah Spencer, below, says that Kenny Davern loved Ben.] Brian White still says he was the best trumpeter he ever had in his bands. Ben and Alex Revell were the front line along with Chris Barber in his amateur band before Chris made it a full time professional band. Ben was an engineer with his own business and remained a part time musician throughout his career. Alex was a also a noted engineer and designer, and they played together again in Ben’s Hot 5 & 7. Jon Penn was the pianist, and Nick Ward the drummer, both now at Whitley Bay every year. Now for a rare treat – a new Ben Cohen Hot Five Seven concert never before published – Launched in 1993, Ben’s Hot Five caused an immediate sensation at the Bude festival that year, since when they have starred at major festivals all over the country. 1994 saw the launch of an even more exciting Hot Seven. Ben Cohen, hailed by Humphrey Lyttleton as today’s finest trumpeter in the “early Louis” style, leads Alex Revell (clarinet), Mick Clift (trombone), Jon Penn (piano), Geoff Over (banjo), and they are joined in the Hot Seven by Terry McGarth (sousaphone), and Nick Ward (drums) with special guest Norman Field (reeds). Ben Cohen is one of the legendary backroom boys of British Traditional Jazz. He first came to notice in Chris Barber’s amateur band in 1950. He based his style on that of early Louis Armstrong and over the years developed a reputation as a powerful lead player in any band he was in. He stuck religiously to playing the cornet rather than the trumpet and was only ever semi-professional throughout his career. Ben was a popular figure on the UK Jazz scene and for many years led his Armstrong inspired Hot 5. A brief guided tour: YOU MADE ME LOVE YOU (Ben, vocal); PAPA DIP; GULLY LOW BLUES (Ben, vocal); EAST COAST TROT (featuring Alex and Norman); NO ONE ELSE BUT YOU (Alex, vocal); TAKE YOUR PICK (featuring Geoff Over); an interlude where the band removed their jackets; MABEL’S DREAM; WEARY BLUES; SOME OF THESE DAYS (Ben, vocal); WILLIE THE WEEPER (Geoff Cole, vocal); I CAN’T SAY (Alex and Norman); ONCE IN A WHILE; ROCKIN’ CHAIR (Ben, vocal); BIG FAT MA AND SKINNY PA (Alex, vocal); KNEE DROPS; AFTER YOU’VE GONE (closing theme). I am sorry that I never got to hear him in person, and — even more — tell him how much his music moves me. But here is evidence of gorgeous nimble heat in the best Louis manner. Thank you, Ben Cohen. Posted in "Thanks A Million", Awful Sad, Bliss!, Generosities, Hotter Than That, Irreplaceable, It's All True, Jazz Titans, Jazz Worth Reading, Pay Attention!, Swing You Cats!, That Was Fun!, The Heroes Among Us, The Real Thing, The Things We Love, Wow! The splendors of the 2012 Whitley Bay Classic Jazz Party continue in a set celebrating the compositions and recordings of Miss Lil — Lillian Hardin — in the Twenties. On the marriage license she was L. H. Armstrong, but she did more than keep house: she wrote songs and led hot recording sessions. And she was one of the few early women to do these things successfully. In addition, without Miss Lil, husband Louis might have stayed comfortably as Joe Oliver’s second cornetist for many years . . . material for an alternate-universe science fiction novel. Lil’s recording career continued on through the Thirties — with a brilliant series of Decca sessions, a few featuring Joe Thomas and Chu Berry — and the Forties. As a child, one of my first jazz records ever was a 12″ Black and White 78 of “Lil ‘Brown Gal’ Armstrong” with Jonah Jones, J. C. Higginbotham, Al Gibson, and Baby Dodds — among others. She played and recorded with Sidney Bechet and Chicagoans . . . always exuberant, energetic. Early on, I remember being swept up in the force and joy of Louis’ Hot Fives and Sevens, and only later coming to the sessions that paired Lil with Johnny Dodds, George Mitchell, and others — powerful music where the players’ delight was absolutely tangible. As it is here! Here are a half-dozen 2012 performances featuring Matthias Seuffert, clarinet; Bent Persson, cornet; Staphane Gillot, reeds; Jens Lindgren, trombone; Martin Seck, piano; Martin Wheatley, banjo; Malcolm Sked, bass. As I write this, I am listening to a “new” box set of Louis Armstrong’s recordings. Issued by Sony Music, it offers his work for OKeh, Columbia, and Victor from 1925-1933. I am ambivalent about this product — which has nothing to do with the heartbreakingly beautiful music contained within the purple box. And although I ordinarily go on at length on JAZZ LIVES, I find it easier to write my assessment as a checklist. 181 recordings by Louis, grouped together in this fashion for the first time in the United States. (The Fremeux label has been issuing multiple CD sets of Louis in chronological order for some time.) This means the familiar — POTATO HEAD BLUES and I’VE GOT THE WORLD ON A STRING — alongside sessions that have not been available for some time, including the wonderful sides Louis made for OKeh in Los Angeles and Chicago, 1930-31. The set ends with the peerless 1932-33 Victor sides (THAT’S MY HOME, LAUGHIN’ LOUIE) and throws in BLUE YODEL # 9, the collaboration of Louis and Jimmie Rodgers. Beautiful notes by Ricky Riccardi. Need I say more? Lovely photographs, some new to me, photographs of record labels, and a design that — for once — doesn’t decompose as soon as one opens the box. A reasonable price, if you consider the amount of music purchased. The first two discs (containing the Hot Five and Seven material) are mastered off-pitch, a half-tone low. This might not bother most listeners, but it makes the music sound slightly sleepy, draggy — which it wasn’t in performance. I always wonder how much thought goes in to the production of one of these box sets, conveniently on sale at the holiday season. Sony Music has this material in their vaults; they seem to have done nothing to it (checking proper pitch, remastering) except put it in a different box and offer it to us. It is not exactly a jazz re-gift, but close. Who did they think was going to buy it? Some people who lack a historical consciousness will quail slightly at “1925-1933,” because that is OLD MUSIC. And the deep-down Louis scholars were already thrashing around online before the box came out, so I think their disappointment is palpable. I also do not know how many people actually are buying CD box sets — as opposed to listening to downloads through their earbuds (two words that have become loathsome to me). Ultimately, any scrap of Louis Armstrong’s music is beautiful, valuable, irreplaceable. But Louis deserved better than this set. We do, also. Should you buy it if you have unlimited funds? Yes. Will you find some aspects of it annoying? Yes. Posted in It's A Mystery, Jazz Titans, Pay Attention!, Swing You Cats! The trumpet master Joe Thomas, aplacid, reserved man, didn’t make as many recordings as he should have. But he played alongside the finest musicians: Jack Teagarden, Vic Dickenson, Red Norvo, Roy Eldridge, Coleman Hawkins, Herman Chittison, Benny Carter, Barney Bigard, Joe Marsala, Buck Clayton, Teddy Wilson, Sidney Catlett, Edmond Hall, Art Tatum, Pete Brown, Claude Hopkins, Kenny Kersey, Big Joe Turner, Pee Wee Russell, Buddy Tate, Tony Scott, Dicky Wells, Oscar Pettiford, Lil Hardin Armstrong, Maxine Sullivan, Benny Morton, Bobby Gordon. Harry Lim (of Keynote Records) was a special champion of Joe’s and featured him on many sessions. My ears tell me that JUMP has a close relationship with STOMPIN’ AT THE SAVOY, exceedingly familiar chord changes for that period. The line sounds at first simple, something out of a child’s scale exercise — but it turns more adventurous. There is a suggestion of a phrase we know from DIZZY ATMOSPHERE as well. Swing and Be-Bop were adjacent, simultaneous, rather than two epochs as the journalists wanted us to believe. Byas swoops and hollers, evoking Ben, over that concisely effective rhythm section, with Guarneri offering his own synthesis of Waller and Basie over Taylor’s powerful bass and Cole’s restrained drums — their sound somewhat swallowed by the whoosh of the 78 surface, although his bass drum is a swing heartbeat. A simple phrase, in Thomas’s world, is a beautifully burnished object. And one phrase flows into another, so at the end of the solo, one has embraced a new melody, resonant in three dimensions, that wasn’t there before, full of shadings, deep and logically constructed. The band returns for the last statement of the theme, but it’s Joe’s solo I return to. Louis, speaking about playing the trumpet, praised as the greatest good “tonation and phrasing.” Joe’s tone, dark and shining, makes the simple playing of a written line something to marvel at, and each of his notes seems a careful choice yet all is fresh, never by rote: someone speaking words that have become true because he has just discovered they are the right ones for the moment. I offer JAMBOREE JUMP as prelude to something even more marvelous. Harry Lim, the guiding genius of Keynote Records — which, session for session, was consistently rewarding — loved Joe and featured him often. The Pete Brown All-Star Quintet had a splendid rhythm section and the contrast between Joe’s stately sweetness and Pete’s lemony ebullience. IT’S THE TALK OF THE TOWN shows off not only the contrast between them, stylistically, but also in tempos — this 12″ 78 (another one of the independent labels’ of the time’s great ideas — thank Milt Gabler and Alfred Lion) contrasts sweeping elegance with double-time romping. If you’ve heard little of pianist Kenny Kersey, his chiming, serious solo introduction is evidence that he is another unheard master. Then Joe comes to the fore in a sorrowing embellishment of the theme. Hear his vibrato, his tone — without stating anything in melodramatic capital letters, he says, “What you are hearing is very serious to me. It comes from my heart.” Indeed, I think of the great later Louis of THAT’S FOR ME. Joe is somber and tender at once, lingering over a note here, adding a small ornamental flourish, as he does at the end of the first sixteen bars, almost in a casual whisper, his brass voice trailing away. Around him, the elements are in place: the warm resonance of Milt’s notes; the gentle timekeeping of J.C. Heard; Kersey, pointing the way; the sweet understated agreements provided by Pete’s alto. When Joe would sing TALK OF THE TOWN, he would get even more emphatic on the bridge. A song that begins, “I can’t show my face” already starts passionately, but the bridge is a drama of disappointment and betrayal: “We sent out invitations / To friends and relations / Announcing our wedding day. / Friends and relations gave congratulations. / How can you face them? / What can you say?” Here, Joe’s trumpet rises to depict this heartbreak without increasing his volume or adding more notes. The run that begins the second half of the bridge is Joe’s version of an early Thirties Louis phrase in sweet slow-motion. Something startling comes next, and although I have known this recording for several decades, I can’t prepare myself for it: Pete Brown and the rhythm section go into double-time. Pete loved to push the beat, and perhaps the idea of playing TALK OF THE TOWN as an extended ballad seemed too much of a good thing. I also wonder if Pete knew that to follow Joe in the same fashion was not a good idea*. Whatever the reason, the spirit of Roy Eldridge playing BODY AND SOUL at double-time is in the room. Although Pete’s rough bouncy energy is initially startling, his bluesy vocalized tone is delightful, and the rhythm section digs in (Heard’s soft bass drum accents suggest Catlett). And there’s the SALT PEANUTS octave jump at the end of the bridge, too. It’s left to Kersey to return everyone to the elegiac tempo set at the start, and he does it beautifully, although the section has to settle in. Joe returns, declamatory and delicate. Where many trumpeters of the period might have gone up for a high one, Joe repeats the title of the song as if to himself. I have loved Joe Thomas’ work for forty-five years, having heard him first on an Ed Beach radio show with the Keynote SHE DIDN’T SAY YES and then on a Prestige-Swingville session led by Claude Hopkins and featuring Buddy Tate. His playing still moves me. Although his simple notes are not difficult to play on the trumpet, to play them as he does, to learn how to sing through metal tubing is a lifetime’s work. There were and are many compelling Louis-inspired trumpeters, and they all brought their own special joy. But there was only one Joe Thomas. Thanks to SwingMan1937 for posting JAMBOREE JUMP and to sepiapanorama for IT’S THE TALK OF THE TOWN. These generous YouTube folks have excellent taste! That’s Bent on trumpet and Hot Choruses; Kristoffer Kompen, trombone; Matthias Seuffert, clarinet; Keith Nichols, piano; Phil Rutherford, sousaphone; Keith Stephen,banjo; Nick Ward, drums. 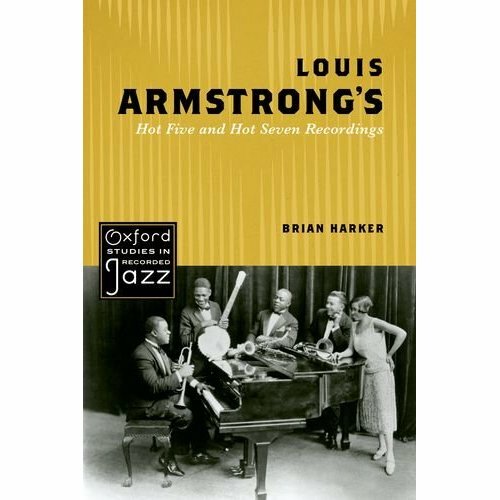 All of this music was originally created and recorded in 1927 Chicago — as Louis Armstrong and his Hot Seven. “Hot Choruses” might require a few lines of explanation. In that year, with Louis’s fame growing, he was asked to record a series of “hot choruses” and “breaks” that other trumpeters might — with practice — incorporate into their performances. The recordings have never been found, but the books still exist, and Bent made a deep and lengthy study of them . . . the results exist on four records or three CDs on the Kenneth label — rewarding and inventive music. On the last two songs here, Bent incorporates a Hot Chorus — especially revealing in BLACK BOTTOM STOMP, a Morton composition Louis never recorded on his own. Once again, thanks to the generous Flemming Thorbye and Elin Smith for these videos: see more at “elinshouse” and “thorbye” on YouTube! I made my monthly pilgrimage to the Radegast Bierhall in Williamsburg, Brooklyn last Thursday (May 12, 2011) and had a delightful evening with trumpeter / composer Gordon Au’s Grand Street Stompers. The May edition of the GSS had Gordon, Matt Musselman on trombone, Matt Koza on clarinet, Davy Mooney on guitar, Rob Adkins on bass, and Giampaolo Biagi on drums. The GSS did what they do so well: they swung, they had a wonderful ensemble sound and rocking motion; they created beautiful solos. And in the manner of the late Ruby Braff, Gordon showed himself once again to be not only a soaring trumpeter but a peerless on-the-spot arranger, setting up little duets and exchanges on the bandstand. Here are ten examples of this band’s easy grace. Its title is slightly off, because the Grand Street Stompers surely know . . . . I believe that they will be at Radegast on June 15, for a CD release party — not to be missed!